4.1 out of 5 based on 16 bloggers and 3 commenters. 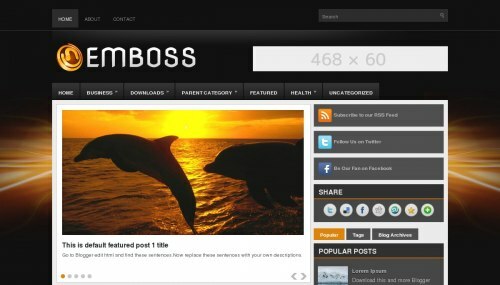 Emboss is a free blogger template adapted from WordPress with 2 columns, right sidebar, ads ready, footer columns, slider, social bookmarking icons, posts thumbnails, tabs and drop down menu. hi, how can i change the size of the slide show ? change height and width of the box, then images. nobody answers messages here no more. is there like a place for that, seriously? i’ll be more than happy answer questions. if i’m right then you’ll probabaly won’t see whats there, will in that case, it’s effing shite messaging here and i see why people dont bother. i expanded this template to 1000px and i cant expand the the footer. can anyone help me? i’m propper stuck.